The banks of the Chobe National Park boast one of the densest populations of elephant on the African continent - estimated at approximately 120, 000. The Park is also home to a large number of buffalo, leopard and lion, along with a variety of antelope and abundant birdlife. Leisurely cruising along its banks and waterways provides for a totally different 'safari' holiday while being surrounded by complete comfort and elegance. This afternoon you will be collected from Kasane and transferred to the cruise. Cruise the river at sunset, with a welcome briefing and mouth-watering dinner. Relax on board with a good book and binoculars, or explore the spectacular Chobe River with a tender boat, and experienced guide, getting up close and personal to the wildlife and birdlife of the area. 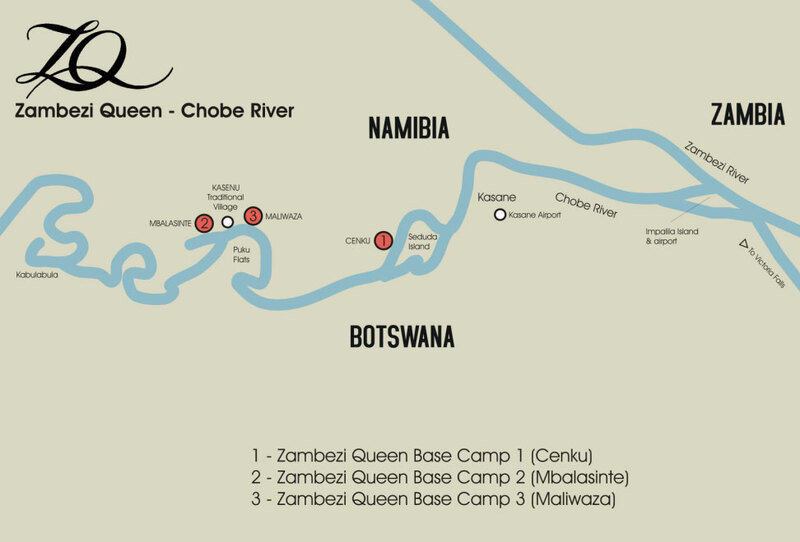 For the adventurous, try your hand at tiger fishing - one of the Chobe and Zambezi Rivers most predatory fish! Enjoy lunch and take in the wonders of the Chobe River and National Park as you cruise. The afternoon activities can include an exciting river safari or fishing excursion and afterwards enjoy dinner and stargazing. Early morning cruise while you enjoy breakfast. Disembark after breakfast and you will be transferred back to Kasane. The 4 Day itinerary will also include a cultural experience, with a guided walk in a nearby rural village, or a visit to our resident 2000 year old baobab tree - a landmark to remember! Today you will be collected from Kasane and transferred to the cruise. Enjoy an afternoon sail on either the Safari Boat or on tender boats. After breakfast in the dining room, cruise in a motorboat for up close water-based game viewing. Sail on the Chobe River while enjoying lunch. Visit a traditional village, or view game from a small motorboat. Dinner is in an African boma on the shore of the Chobe River, including African singing and dancing, followed by stargazing. The 4 Day itinerary will also include additional water based game viewing on tender boats and also an option for a visit into Chobe National Park (additional cost). All suites have private balconies and fans, full length sliding shutter doors for both privacy and protection from the sun, mosquito screens and the finest finishes. Four Master Suites have their own private deck with outdoor furniture and panoramic views. On entering the first of 3 decks, guests will find a well appointed air-conditioned reading room which includes a library of books on the fauna, flora and history of the area, numerous games, and a computer facility with internet access. This level also includes a curio shop and cruise director's office. The remainder of the first deck and the entire second deck contain the 10 Suites and 4 Master Suites. The third level/entertainment deck includes the following: dining facilities, an open plan lounge area with unobstructed views, a computerised telescope for exploring the African night sky and a well appointed bar with the finest wines and spirits. All internal areas on the top deck are protected by mosquito screens which allow for a comfortable environment for dining and relaxing. There are two outside areas on the top deck, one aft which provides a shaded area with comfortable seating and the other on the foredeck which includes a plunge pool and sun bathing area. • Children of all ages are welcome on board the Chobe Princesses. Special four night savings also include a complimentary Chobe National Park Game Drive! Offers may not be combined with any other promotional offers, and are subject to availability.